The Hermes Standard Initiative was committed to this from the very beginning in order to provide what it takes establishing one global standard, that can be shared by all equipment vendors easily, freely and at fair conditions . Because this is believed to be in the best interest of players in “the market”: Equipment vendors, manufacturers, end-customers, and “innovation” as such. 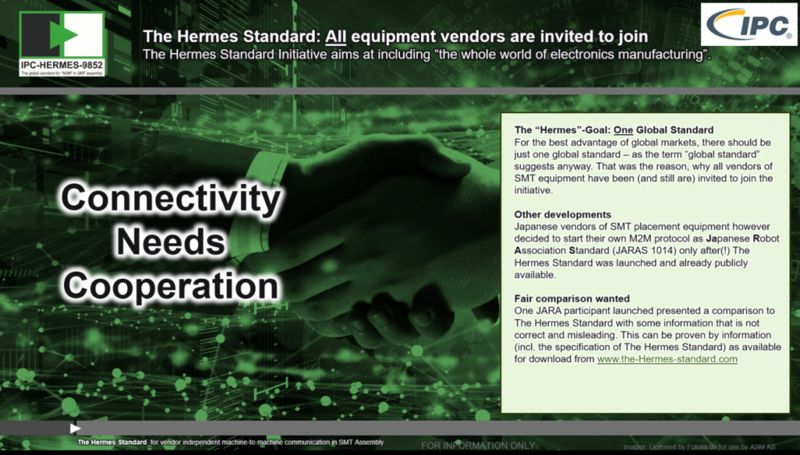 For that purpose, all equipment vendors have been (and still are) invited to join The Hermes Standard Initiative. However, a group of mainly Japanese vendors (organized in a sub-committee of the Japanese Robot Association, JARA) decided not to join but to go for a similar yet separate approach shortly after The Hermes Standard was announced and published in full at www.the-hermes-standard.info. While The Hermes Standard specification can be asessed by everyone for an in depth analysis of potentials and capabilities, the related JARA information is (at least currently) not publicly available. Further, at least one member of the JARA group decided to present a comparison (from their point of view) of both (still quite very similar) approaches, where at least some of the given (negative) judgements regarding The Hermes Standard appear to be either wrong or misleading or based on misconception. After all, we recommend to do an own comparison, based on real (full) specs and existing applications. As mentioned above: The Hermes Standard is open for being compared if it is fair and based on available facts. The time of “closed rooms” should be over.